Premium Quality S187093 Black Inkjet Cartridge compatible with the Epson MJ-810c. The use of compatible supplies does not void your printer warranty. Premium Quality S193110 Tri-Color Inkjet Cartridge compatible with the Epson PM-2000C. The use of compatible supplies does not void your printer warranty. Premium Quality T559120 Black Inkjet Cartridge compatible with the Epson Stylus Photo RX700. The use of compatible supplies does not void your printer warranty. Premium Quality T559220 Cyan Inkjet Cartridge compatible with the Epson Stylus Photo RX700. The use of compatible supplies does not void your printer warranty. Premium Quality T559320 Magenta Inkjet Cartridge compatible with the Epson Stylus Photo RX700. The use of compatible supplies does not void your printer warranty. 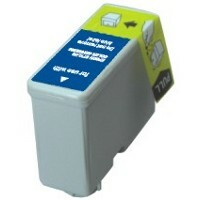 Premium Quality T559420 Yellow Inkjet Cartridge compatible with the Epson Stylus Photo RX700. The use of compatible supplies does not void your printer warranty.